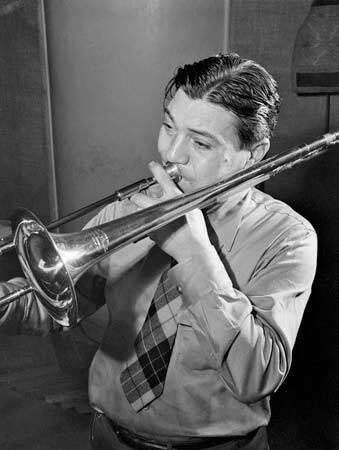 One of the most beloved figures in jazz history, Jack Teagarden was a double-threat as a trombonist and a singer. Before he arrived in New York in 1928, most trombonists played in a guttural percussive style that had been pioneered by Kid Ory in New Orleans. The trombone, a potentially witty instrument (which was its main function in vaudeville), was mostly used to fill in ensembles, harmonizing with the lead voice (usually the trumpet or cornet) and taking short rhythmic solos. There were two early exceptions. Miff Mole, who came to prominence with groups led by cornetist Red Nichols, took adventurous solos that featured wide interval jumps and unconventional ideas. And Jimmy Harrison, as a member of the Fletcher Henderson Orchestra, played in a legato style that hinted at Teagarden’s innovations. They were friends and probably influenced each other a bit. But otherwise, the trombone was largely a secondary instrument in jazz until Teagarden came along. A friendly revolutionary, by the late 1920s Teagarden could play his instrument on the same commanding level as a trumpeter. He was also a superior blues and jazz singer whose charming Texas drawl and swinging placement of notes made him one of the first white Americans to effectively sing the blues on record. Jack Teagarden was born in Vernon, Texas on Aug. 29, 1905, moving with his family to Chappell, Nebraska in 1918 His mother, Helen Teagarden, was a ragtime pianist and his younger siblings (trumpeter Charlie, pianist Norma and drummer Cubby) would become musicians in the future with Charlie having a significant career. Jack started on the piano when he was five, took up the baritone horn at seven, and switched to the trombone when he was ten. By 1920 when he turned 15, he was performing with his mother in local theaters. Teagarden played throughout the South for the next eight years. Among the many groups that he worked with were Peck Kelley’s Bad Boys (1921-23), Doc Ross’ Jazz Bandits (1925-27) and Johnny Johnson’s Staler Pennsylvanians. He made his recording debut (two obscure titles) with the latter in late 1927 when they came to New York. Staying in New York, Teagarden worked with Wingy Manone’s group for a week, toured with a variety show, and performed with Billy Lustig’s Scranton Sirens at the Roseland Ballroom in Feb. 1928. Word quickly spread about the exciting young trombonist. He was on a record date with songwriter Willard Robison but really gained attention for his playing on two versions of “She’s A Great Great Girl” with Roger Wolfe Kahn’s orchestra. His virtuosic statements showed what the trombone was capable of. After working with trumpeter Tommy Gott for two months, Teagarden joined the Ben Pollack Orchestra, a major jazz band also featuring a 19-year old clarinetist (Benny Goodman) and cornetist Jimmy McPartland. Glenn Miller had been Pollack’s trombone soloist but Teagarden’s innovative playing resulted in Miller emphasizing his arranging skills. No matter how complex the material, Teagarden could handle it easily while always sounding relaxed. Teagarden was a reliable (if often underutilized) member of Ben Pollack’s band for five years and was in great demand for record dates. With Eddie Condon he recorded such classics as “I’m Sorry I Made You Cry,” “Makin’ Friends (his earliest vocal), and two takes apiece of “I’m Gonna Stomp Mr. Henry Lee” and “That’s A Serious Thing.” Those solos alone would have clinched his immortality. During 1928-33, Teagarden also recorded often with Red Nichols’ Five Pennies (including a remarkable reworking of “The Sheik Of Araby”), Irving Mills (who led such exotically-named groups as Goody’s Good Timers, Mills’ Musical Clowns and “The Hotsy Totsy Gang), and Sam Lanin’s studio orchestra, and made memorable appearances with Jack Pettis’ Pets, Red McKenzie’s Mound City Blue Blowers, Joe Venuti, Benny Goodman, Bessie Smith (her last session), Billie Holiday (her first recording), and Fats Waller. He met up with Louis Armstrong for the first time on 1929’s “Knockin’ A Jug” (pity that their version of “I’m Gonna Stomp Mr. Henry Lee” from that session is unissued and lost) and with Bix Beiderbecke on two record dates. Teagarden first sang “Beale Street Blues” on record with a pickup group led by Gil Rodin in 1930 and he took the vocal on “Basin Street Blues” with the Charleston Chasers the following year. Both songs became permanent parts of his repertoire. He first recorded the ballad “A Hundred Years From Today” with Ethel Waters, later singing it himself as a touching ballad. Teagarden also led some of his own sessions starting in 1930. The Ben Pollack Orchestra never lived up to its potential with its drummer-leader being unsure how to balance the commercial with the artistic. The musicians revolted altogether in 1934 when Pollack was promoting his singing girlfriend at the expense of the band. The sidemen left Pollack and decided that Jack Teagarden would be their ideal leader. But unfortunately Teagarden had departed months earlier and had signed a five-year contract with Paul Whiteman. The musicians eventually settled on Bob Crosby as their new leader. At first it seemed like a good move for the trombonist. The Depression was at its nadir during 1933-34 and a soft job with Whiteman, who was still being advertised as “The King Of Jazz,” paid well. Little did Teagarden know that the Swing era was coming in the near future. While he had occasional features with Whiteman’s orchestra, much of the time was spent playing dance music, concert works and novelties. He did get to appear now and then on freelance record sessions including with C-melody saxophonist Frank Trumbauer (with whom he briefly co-led The Three T’s along with brother Charlie), Wingy Manone, and Eddie Condon (playing beautifully on “Diane”). But while his friends were becoming famous bandleaders, Teagarden was just biding his time. When his Whiteman contract finally ran out in Dec. 1938, Teagarden was free at last. He soon formed his own big band but that was ultimately a mistake. By 1939 there seemed to be three big bands on every corner and Teagarden’s orchestra had trouble carving out its own niche in the overpopulated field beyond its leader’s talents. It would be an often fruitless seven year struggle. But despite the difficulties, Teagarden created some great music during the era. While his big band sides sometimes had moments of interest, he sounded most inspired on his own combo dates and on recordings with the Metronome All-Stars, Bud Freeman’s Famous Chicagoans (including “Jack Hits The Road”), Eddie Condon (both on records and as a guest at some of Town Hall concerts) and the Capitol Jazzmen (“Casanova’s Lament”). Teagarden was part of the remarkable Esquire All-American Award Winners concert of Jan. 18, 1944, meeting up with Louis Armstrong, Coleman Hawkins and Art Tatum. He also played and acted quite credibly in the 1940 Hollywood film Birth Of The Blues particularly on “The Waiter and The Porter and the Upstairs Maid” with Bing Crosby and Mary Martin. In 1946, the collapse of the big band era resulted in a bankrupt Jack Teagarden reluctantly calling it quits. However his talents and his name were very much intact. Bing Crosby bailed him out of his financial troubles and, in mid-1947, he became a member of the first version of Louis Armstrong All-Stars. Armstrong and Teagarden shared a mutual love and they were a perfect team. Check out their singing and tradeoffs on “Jack Armstrong Blues.” “A Song Was Born” and “Please Stop Playing Those Blues.” The interplay between the two can be seen as well as heard on several songs in the 1951 movie The Strip. Teagarden had found the perfect musical home and he stayed for four years. A few months after The Strip, Jack Teagarden (with Armstrong’s blessing) was ready to go out on his own again. He formed a Dixieland sextet that included Charlie Teagarden on trumpet and played the music that he loved most. Although his repertoire was somewhat predictable (“Basin Street Blues,” “Beale Street Blues,” “A Hundred Years From Today,” “Stars Fell On Alabama,” his theme “I’ve Got A Right To Sing The Blues” and a new virtuosic workout on “Lover” were musts), he always played and sang with enthusiasm, joy and subtle creativity. Teagarden stayed active during his last 13 years. Highpoints included recordings with Bobby Hackett, a 1955 reunion with Paul Whiteman, an album with Bud Freeman, singing “Rockin’ Chair” with Louis Armstrong in the 1958 film Jazz On A Summer’s Day, an extensive tour of Asia during 1958-59, his appearance on the television special Chicago And All That Jazz with Eddie Condon in 1961, and his 1962 album of wistful Willard Robison pieces called Think Well Of Me. With Don Goldie as his trumpeter, Teagarden had a strong Dixieland group for a few years in the 1960s, but his decades of excessive drinking and a general world weariness (which had made him perfect for the Willard Robison album) were taking its toll. There would be one more highpoint. At the Monterey Jazz Festival on Sept. 20-21, 1963, Teagarden was featured on two sets. While the first had him in a hot group with clarinetist Pee Wee Russell, baritonist Gerry Mulligan, pianist Joe Sullivan and trumpeter Charlie Teagarden, it was the second appearance that was most poignant. Jack was joined not only by Charlie but his mother Helen (for two songs) on piano and sister Norma. Fortunately the family reunion was recorded and it was released by the Memphis Archives label as A Hundred Years From Today. Less than four months later, on Jan. 15, 1964, Jack Teagarden died from a heart attack at the age of 58. 53 years later, he is still remembered as being one of the greatest of all jazz trombonists, a fine singer and a lovable personality. This is the first in Scott Yanow’s series of biographical articles on classic jazz greats. Write him at scottyanowjazz@yahoo.com.